You never fully know what you are driving out to as you exit the harbour, heading for the fishing grounds, which always makes dropping your lines for the first time of the day exhilarating. Today my guests and I started our morning off at Klashwun Point. The flat calm seas made for a quick drive and the blue skies had everyone smiling. I had just finished explaining to my guests how to pop the line out of the downrigger clip when both lines started peeling. No need to pop the clip when fish hit that hard! My guests landed a beautiful 21 lb. and a 19 lb. double header, which was not a bad way to start the day! Following our exciting start we looked up and saw a boat getting pulled offshore as they fought a fish – this fight resulted in a Tyee release! 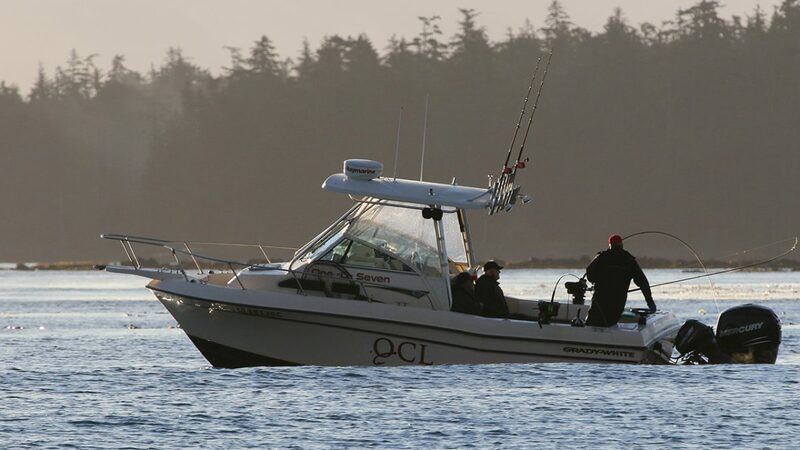 The day continued with consistent Chinook action off the face of Klash, followed by some quick Coho bites in the tide lines around Shag Rock. It’s exciting not fully knowing what’s coming down the pipe for tomorrow – I look forward to wetting the lines and finding out! nextQCL Halibut Record is Broken Again!